The Archives of Labor and Urban Affairs holds the largest labor archives in North America and is the official repository for twelve national labor unions. Images from these organizations date back to their birth and continue on into the 21st Century. Some images in this gallery are from the UAW, IWW, AFSCME, ALPA (Air Line Pilots Association), AFT (American Federation of Teachers), NALC (National Association of Letter Carriers), UFW (United Farm Workers), and SEIU collections. Collections focus on the history of Detroit from the late 19th century to the present, including such topics as urban development, social welfare, health care, education, politics, civil rights, women’s rights, and metropolitan Detroit communities. 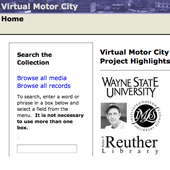 An additional resource, the Virtual Motor City was created in collaboration with the Wayne State University Library System to digitize and catalog 15,000 photographs pulled from the Reuther Library's sizable Detroit News Collection. The site officially launched on March 2nd, 2004 and has grown significantly since then. Or visit, Digital Collections @WSU to learn more. The Wayne State University Archives documents the evolution of the institution from its origins as the Detroit Medical College in 1868, to the world-class research institution it is today. The WSU archives chronicles the growth and history of the university through programs of study, physical expansion, and the many individuals involved with its development. History of the 20th century was dominated by two world wars. From 1914–1918 and again 1939–1945, among millions dead and countless atrocities, countries from all over the world fought for supremacy with devastating repercussions that are still felt today. The Reuther Library frequently displays exhibits, using its collections to tell stories. When a new exhibit opens, the Reuther celebrates its staff's hard work with a reception, inviting interested parties to view the new exhibit and participate in history's narrative. The Reuther also engages with the public through other events like brown bag lunches, seminars, meetings, and other special functions. These Reuther events are documented in this gallery.